Ergonomic placement of all the important controls provides convenient and comfortable handling of the camera functions. Special attention has been paid to the position of the front and rear main dial and the display illumination. A lever in the rear housing allows to activate the AF-On OR the AE/FE Lock button. The camera is mounted on a saddle for precise positioning inside the housing. A 4 mm main-O-ring and the SUBAL QuickLock system make it virtually im possible to close the lid if the O-ring is not lying correctly in its groove. Maximum security is assured. Generous shading of the LCD-monitor provides a dazzle-free view to the brilliant image of the camera monitor and works well with the HD-video function of this camera. Threaded holes underneath the housing allow the mounting of trays and/or accessories. A top mounted plate with a threaded hole is provided for attaching a light-weight aiming light. The housing incorporates an excellent viewfinder optic for full frame viewing. 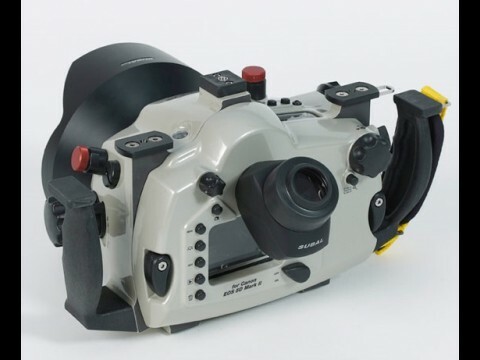 Optionally the housing can be assembled with the magnifying Viewfinder Optic GS 180 or the magnifying, 360° rotatable, Viewfinder Optic WS 45. As with all our products choice of materials, machining, surface protection and finish conform with SUBAL’s well known standards of re liability and workmanship. All SUBAL ports with bayonet mount will fit this housing. Seawater resistant aluminium alloy, machined from a solid block, extreme surface hardened and corrosion resistant through Hard Coating. All parts manufactured from anodized and hard coated aluminium, acid proof stainless steel or high quality plastics. Seals are seamless precision O-rings. O-rings in hard coated glands. SUBAL QuickLock latching system. 2 Flash connectors: Optionally Nikonos V, IKELITE or S6 sockets, parallel connected. TTL mode available ONLY with S6 socket and original Canon flash gun or strobes with e-TTL! Two 25mm T-plates. TLC or Ultra light bases are available as an option. With the SUBAL CD5MII for the Canon EOS 5D Mark II SUBAL offers an aluminium housing for the newest development of full-frame-SLR cameras from Canon, with no reduction in the angle of coverage! There is no limitation to the creativity of the underwater photographer! Power On/OFF, Shutter Release, Display Illumination, AF-On, Zoom/Manual Focus, Front and Rear Main Dial, Exposure Mode Dial, Lens Release, Cursor. Metering Mode/White Balance, AF/Drive, ISO/Flash Compensation, Menu, Picture Style, Info, Play, Erase, AF Point Selection, Set, Live View.